One thing I loved as a kid was going to Wyatt's Cafeteria and getting fried okra on the side of a piece of fried cod. I never liked it when it was made at home because it never came out right. I would sometimes buy the frozen premade but it still wasn't the same. Sunday brought a little inspiration to the kitchen (in the midst of clothes dryer repair) and decided to try it from scratch. It not only was delicious but it was easy! 1. Defrost your bag of okra. Once it is completely defrosted drain on a towel to remove excess water. 2. In a bowl mix eggs, milk, and a good dash of each of garlic salt and pepper. 3. In another bowl add the flour, good dash of garlic salt and pepper. 4. In a shallow baking dish dump the bread crumbs. 5. Place 1/2 of the okra into the flour and stir around to coat well. 6. Using a fork place floured okra into egg mixture and coat well. 7. Using another fork, transfer okra from egg wash into bread crumbs and using hands turn around bread crumbs until okra is well coated. 8. 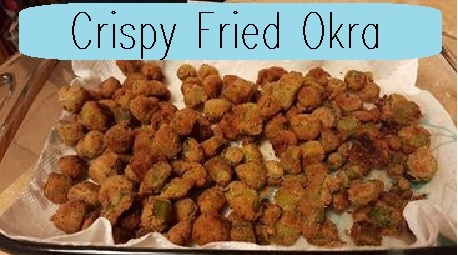 Place crumb coated okra on a plate, and proceed steps 5-7 with the remaining okra. 9. With an electric skillet set to 350* heat oil. 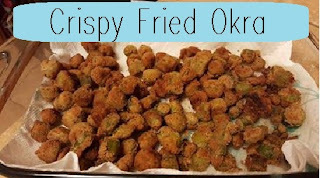 Once oil is well heated (test by adding in one piece of okra ~ if it is bubbly around the edges your good to go), carefully place 1/3 of the okra into the oil to cook. After a couple of minutes, turn okra to ensure all of the surface is crispy and browned. 10. Remove from oil onto a pan that is lined with paper towels and lightly salt. 11. Continue until all okra is cooked.